After a long absence the Inland Championships made a return to the Sonata Calendar. Despite being early in the season, 12 boats entered the event organised by Windermere Cruising Association over the weekend of 10th / 11th March. A total of 6 races were scheduled for the Saturday. The forecast for light winds proved correct but the race committee were able to get 6 races started. National Champion Steve Goacher and crew on Eric the Boat showed their intent in race 1 by leading from the start and finished with a comfortable lead over Scottish boats Virtuoso and Old School who finished 2nd and 3rd respectively. In continuing light and tricky wind conditions the next 2 races were to be dominated by Virtuoso. Guy Neville and his crew took the early leads off the start line and extended throughout both races. Missred and Irie Blue each took a 2nd place with Eric the Boat taking the 3rd places. Races 4 and 5 saw Eric the Boat, Virtuoso and Old School resume their 3 way battle. Eric the Boat return to winning ways with Old School and Virtuoso battling it out for 2nd place on the final downwind leg of race 4 with Old School just crossing the line ahead of Virtuoso in 3rd place. Old School took control of the next race but a small mistake on the downwind leg let Virtuoso and Eric the Boat through. Despite some close racing, Virtuoso took the win with Old School unable to get back past Eric the Boat for the 2nd place. 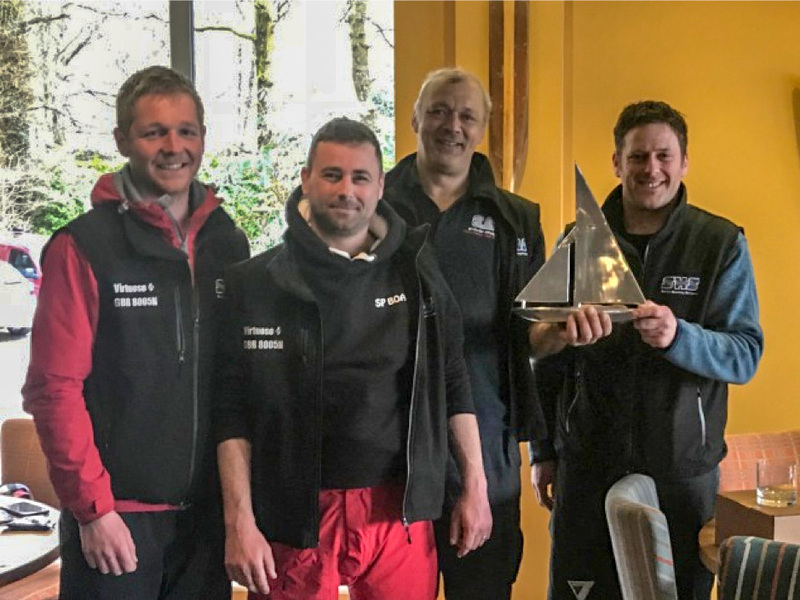 With visibility reducing on the lake, race 6 was abandoned and the crews returned to Royal Windermere Yacht Club for Six Nations rugby and a wonderful class dinner. Sunday morning dawned sunny and windless. After a long postponement and a few boats opting to head for home, a light south-easterly filled in. With the prospect of only two races and Virtuoso leading by 2 points, they successfully match raced Eric the Boat down at the start with both boats starting 4½ minutes late with Virtuoso in front. Eric the Boat wriggled out into wind from the left and had pulled back to second by the first windward mark behind Missred with Flashpoint 3rd and Virtuoso 4th. Eric the Boat took the lead on the run and Positions held until the last windward mark when Virtuoso niftily hitched left and pulled up into second. Now with only one race left and a 1 point lead for Virtuoso, battle commenced in the pre start. Eric the Boat held Virtuoso pinned on the line but both boats were early and had to gybe round to re-start. Flashpoint, Missred and Not Another One were too quick out of the blocks this time to finish in that order and with Eric fourth, and needing a win, Virtuoso’s 1 point lead remained intact for a well deserved victory in the weekends light and difficult conditions. Thanks go to everyone involved from Windermere Cruising association, the members and staff of Royal Windermere Yacht Club and of course Steve Goacher who was the driving force behind the weekend. The next event for the Sonatas is the Scottish Championships being held as part of the Scottish Series 25th – 28th May.